I have a student who has a neurostimulator for back pain. What exactly is a neurostimulator, and are there any implications for diving? Neurostimulators are surgically implanted devices that have some similarity to cardiac pacemakers. Used for chronic pain as well as other conditions ranging from gastrointestinal problems to Parkinson's disease, they are implanted under the skin and have leads (wires) that run from the device to the areas in need of stimulation. 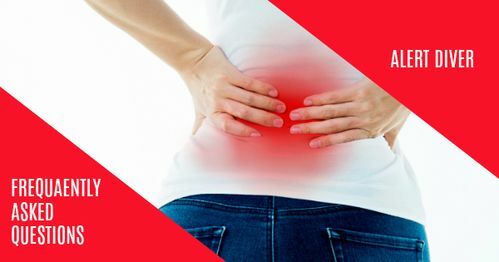 Neurostimulators used for chronic back pain are often placed in the abdomen or upper part of the buttocks, and the leads are placed in the epidural space near the spinal cord. As with other implanted electrical devices, there are some issues divers should consider relative to both the device itself and the underlying medical condition. An important consideration relative to the device is the pressure rating. These particular devices are often rated only to an ambient pressure of 2 atmospheres absolute (33 feet/10 meters of seawater). Medtronic, one manufacturer, states that exceeding this pressure could lead to degradation of the system. Furthermore, exceeding the recommended maximum pressure could lead to changes in the way the device works or cause it to fail, which would require surgical removal and reimplantation. People with neurostimulators can determine the pressure rating of their system by reviewing in the literature provided to them the sections that address sports and other activities. They can also get information by calling the toll-free number on the device identification card and providing the serial number. Another consideration that shouldn't be overlooked is the underlying reason for the device. That condition must be evaluated with respect to any potential problems with diving.